Keep your kegs organized and add your own artistic flair with this chalk board, custom tap handle that comes with four chalk markers. With the Tap Board, it’s easy to write, erase, and the change the name that your wooden tap handle corresponds to, so there will be no confusion about what you're serving. The beer tap handle and frame are made from solid walnut wood for a durable construction, and the face is a genuine chalkboard. Since it’s entirely reusable, you only need one per tap, no matter how often you change what's on tap. When switching out kegs, just wipe the chalkboard clean, write in the new name, and you’re good to go. This bar tap handle kit includes four fine-tip chalk markers in blue, yellow, green, and red. The markers are smear-proof and resistant to rain, so you can use them with confidence indoors and out. You can also write on the board with real chalk (not included), if you prefer. The Tap Board is 7.5 inches tall, with a square chalkboard face that’s 3.25 x 3.25 inch. It fits all U.S. faucet lever threads. 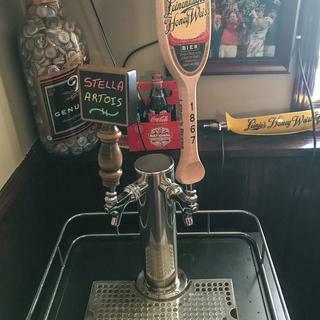 Since it’s designed to fit any standard draft faucet, you can replace your old tap handle and/or install this chalkboard bar tap handle very easily: just screw onto the faucet lever collar atop your draft faucet. It can be screwed on from the bottom of the unit so that the label is facing outwards toward your bargoers. Please note: Some handles will have a protective plastic sheet that needs to be peeled off before writing on. I ordered this as a package for a holiday gift. The tap handle is excellent! We love it and - works very well. However, I would NOT recommend buying the chalk markers. They advertise that the chalk easily wipes away with a damp cloth - this is not the case. After about an hour and two sore arms, I gave up. I was able to get most of the writing off - but the first written label will always faintly remain. Plain chalk works much better. I was disappointed with the chalk markers because it feels like I ruined the tap handle by writing with them. Everything I could have hoped for. Easily cleaned, can find replacement markers for cheap in local crafts stores. The chalk is very colorful and doesn't smear like normal chalk. Since I always change out the type of kegs I buy it was important for me to know what my guests and i were drinking. This is a fun way to showcase that. Love the colored 'chalk' pens! So much more colorful and a cleaner look. Nice to be able to customize! We change beers often and needed something that could illustrate what was on tap. Easy to erase and change names of my home brews in kegerator. My son in law has a keg fridge and likes unique things to be creative this allows him to do that with his beer. Great for customizing our tap handle to show any of the varieties of beer we brew. Looks perfect for when we don't have the right tap handle for a new beer at my bar! So people will know what's inside. We have dual taps. I chose this tap handle to personalize our Kegerator! Because it looks cool and I can customize it. On husband's wish list for Christmas. it is exactly what i have been looking for i have 2 taps and always get different micro brews. My husband just got a kegorator and brews his own beer. This is a perfect way to let us all know what is on tap! Is the chalk board on both sides? BEST ANSWER: No, just on one side...pretty cool though. The markers are great instead of old school chalk. Just one side, the back is wood. We have a Kegco with dual taps, will this fit? BEST ANSWER: It should fit just fine! Very nice handles!